Q: What does your company do? 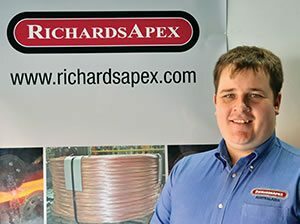 A: With over 100 years of experience RichardsApex manufactures, sells and services quality process lubricants, cleaners and coatings for the metal working industry, specialising in Non-ferrous rod rolling, wire and tube drawing. Q: What is your role there? A: As the Asian Product Manager, I travel throughout the Middle East, India and Asia visiting potential customers, to promote our diverse range of products, and help existing customers with ongoing technical support. Q: What do you like best about your position? A: There is a lot to like about this job; I get to travel to interesting places, try exotic cuisines, experience different cultures and meet a diverse range of people. But what I enjoy most is the problem solving aspect of the job, which involves discussing the customers’ requirements and current challenges and then recommending the solution that best meets the requirements and overcomes the challenges. Q: How does your company remain competitive? A: From our worldwide sales representatives and engineers to our technical R&D team it is the people, their knowledge, experience and relationships that continue to provide the opportunities and innovation to develop technologically advanced products, ensuring RichardsApex is the industry’s lubricant supplier of choice.